StarLoc FiveStar Epoxy resin adhesives are Super strength 2 part resin based adhesives, when the components are mixed together the reaction starts, the delay before cure is as listed on the package. After the time has passed the adhesive resin will cure to form a tough super strength bond. All our epoxy adhesives are solvent free and suitable for use on all surfaces , even solvent sensitive surfaces such as foamed plastics like styrofoam and depron, as well as all other surfaces. 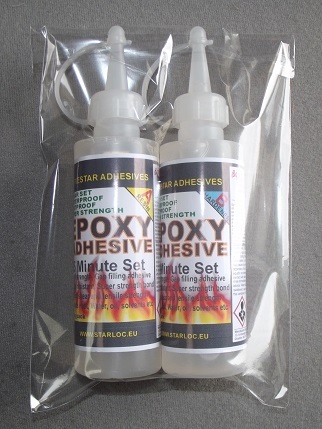 The epoxy adhesive bonds formed are resistant to heat, water ( even hot water and salt water ), most solvents and other chemicals, giving the strongest of bonds in a range of set times. We make a range of epoxy resin adhesives, from standard industrial adhesives and household DIY glues to super impact resistant rubber toughened grades in black and clear formulas. StarLoc Fivestar adhesives are all manufactured in the UK to the highest of standards.